Objective: Join crystal masters around the world in this epic multiplayer tournament held every year in Bryshire Castle. Your host: Dalfin Dobra, the young, powerful, free-spirited and of course ludicrously wealthy, wizard. Supporting actors: Morvran Gruffmarble, the unconventional inventor, and Knittle, the black cat with a secret. Crystal Masters Arena is an insanely addictive multiplayer game of skill and strategy. Play now! 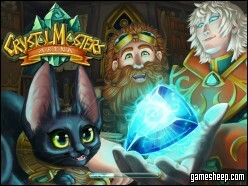 We are glad that you have chosen to play Crystal Masters Arena on GameSheep.com, the most dynamic website available. If you like this game Crystal Masters Arena don't forget to rate it and this way you will help with selecting only the best games for the home page.